The users of windows 7 and windows 8 will be familiar with the XPS and OXPS files which are the windows default printing extensions. XPS (XML Paper Specification) file format was first introduced in windows vista and then added to the windows 7 after the huge failure in windows vista. The OXPS (Open Xml Paper Specification) file format was then introduced in windows 8 OS. So if you are among the users of windows 7 or 8, there will be nothing wrong for you while opening an xps or oxps file but in case you’re using windows xp, linux or any other OS on your computer, you may not be able to open that particular file. In this case, most of people start searching for XPS to pdf converter to download but I don't think it is a good idea if you've one or few files. because downloading and installing software on your computer may slows down your pc too... So If this is the case with you then I'd suggest you to convert that xps file to the PDF (Portable document format) using the free online tools (listed below) so you will be able to open this file in any OS without any hesitation. Now if you are thinking of HOW much converting an xps file to pdf worth? Then let me make it clear that it is worth a few seconds/minutes (depends on file size) and few clicks. Because you don’t need any software to install on your computer in order to convert your OXPS file to PDF. You can open a website from the list below and can upload your xps file so it will convert and give you the converted file as pdf in a very short time. Before we jump to our list of best free XPS/OXPS converters I’d recommend to let have a look at the below free web-apps that we already shared on our blog. Well, so let get started with the list of best and free pdf converters that we collected for our today’s post. Look at the description for each tool and open the one site which you think is best for you. Xps2pdf, a free, simple and a quicker one free online xps to pdf conversion tool that let you convert your files having an extension .xps or .opxs to the adobe’s portable document format. With this simple online tool, you will be able to convert either an xps or oxps file for free. What you have to do is to open this website and on the homepage, you see a button “BROWSE”, so click on it and select the file with xps or oxps extension. And then click on “CONVERT TO PDF” button with red colour. Now wait till the process of conversion ends…. Yet another best and free online tool that let you convert your xps files to the pdf file format. After converting your xps file to the pdf using this tool you will be able to open the file in any operating system. Similarly, you can also make use of freepdfconvert in order to convert your xps to the pdf online free to make xps viewable in any OS without having a .xps to pdf converter to download. PDFaid's xps to pdf converter is a great found that can be used to convert an XPS file of 20 or less than 20 MB to the portable document format for free within your web-browser. It is easy and fast. You can also make use of Zamzar, online2pdf and convert.files to change xps files to pdf online free. 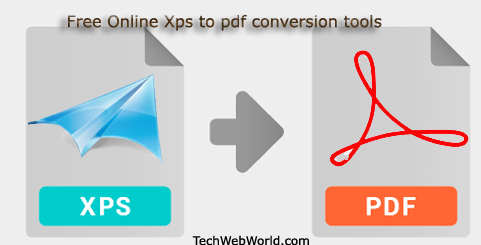 So dear readers, above we shared the best and free online xpx to pdf conversion tools, I hope you found it it useful. If you have anything in your mind then feel free to let us know in the comment box. We will reply to your comment. Also do share this post on your social network profiles and let spread Tech Web World’s voice!!! This is really nice posting!!! I always facing difficulty when i work with window 7 or 8 and this will help me lot. Thanks for sharing this!!! keep visiting and commenting here. Attractive post for student in education for the conversion tools it is may help them to convert their books in their requirement, do my homework for me in high education to secure carrier.